We don’t have a spare room in our house and we would love one. It would be great to just have a room that I would probably use as an office but could also be for kids’ sleepovers and guests who come visiting for the night. I know that’s not often but it can be a real relief for everyone if guests can have their own space. Anyway, short of moving or converting the loft that’s not going to happen anytime soon, so I’ve been thinking of alternative solutions that are both practical and stylish. The practicality has to win here, even though I’d love ensure it looks good, I need to ensure the solution will work. 1. The easiest, quickest solution has to be the inflatable bed! It’s very quick and dirty, great for kids and easy to store. You just need enough space to put the bed down on the floor overnight. I recently saw a loft conversion with kids’ rooms, where the space under the eaves had been utilised for sleepovers. Not enough head space to walk in, but great for lying on the blow up beds and having midnight feasts. 2. Create a multi-purpose room where an existing space is used for guests too. It might be the current office, or a large child’s room, or a den or even a dining room. 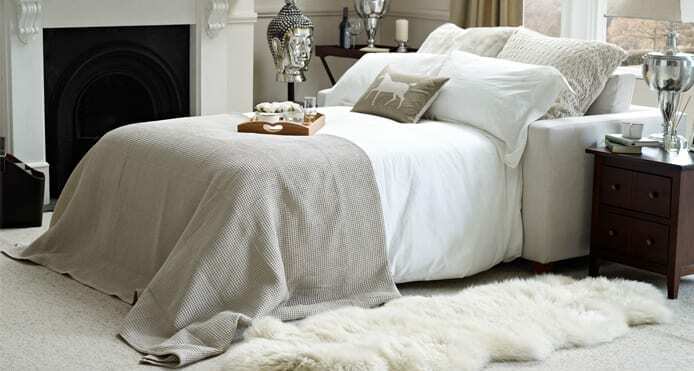 Potentially you can divide the space off, and ‘hide’ the bed area, revealing the arrangements ready for guests’ arrival. It won’t be for everyone but can work for some. Hidden trundle beds are great for this kind of arrangement, and fit neatly under existing single beds. Let the child sleep on a blow up bed for the night and create a lovely double bed for guests. 3. This last idea has to be my current favourite, and that’s to add a sofa bed to an existing downstairs room. We transformed our dining room last year creating more of a multi-use ‘den’ like room which houses our extending dining table, storage, a tv and a sofa. The children spend a lot of time in here playing, using the wii or practising the violin and removing the door through to the kitchen has really opened up the space. However, hindsight is a wonderful thing and maybe what I should have done is purchased a sofa bed, instead of the simple sofa, making it into a space for guests too. I’m really kicking myself about this. I like these from Willow and Hall particularly. Their sofa beds look beautifully designed, contemporary as well as more traditional and would fit in the space. I can see that something like this would have worked really well in the den. When guests are staying overnight you need to be able to provide some practical elements to the sleeping arrangements, like side lights, somewhere to hang clothes, and maybe a table or shelf to store jewellery, watch and drink. We have all of this in the den, and there’s plenty of room to pull out a sofa bed too *sigh*. Never mind, hindsight is a wonderful thing! 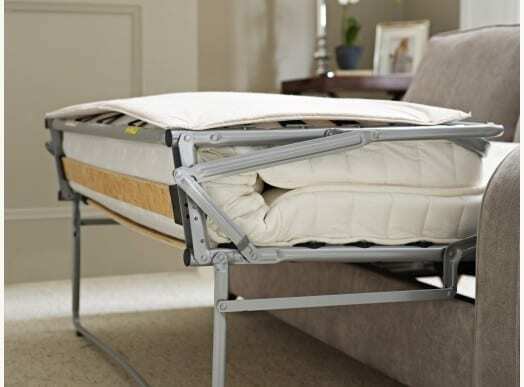 Do you have good sleeping arrangements for your guests? I’d love to know what solutions you have in place. Let me know! This is great…my mum was recently wondering what to do with her spare rooms now that we are all starting to fly the nest and she has re-arranged one room into a reading/ironing/guest room. The sofa bed featured here is gorgeous and looks so comfortable! Unlike my mums rush purchase for us to sleep on over Christmas…think I would have been more comfortable in the bath tub! Haha you gotta love staying over at the family’s place hey? Anyways, yes I agree that is a very nice sofa bed you featured here. Thanks for sharing this Jen! Living in a flat it is always a struggle when friends want to stay. We use a sofa bed in our office/games room. 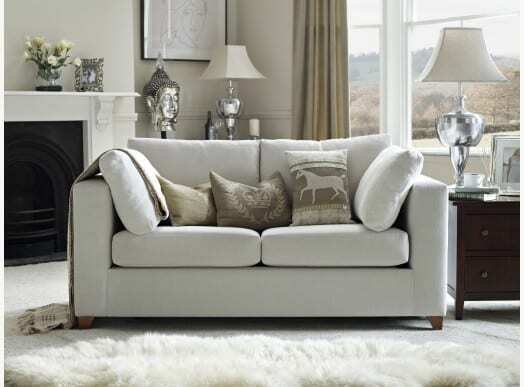 This sofa bed you have featured is lovely! We are lucky and just moved into a semi-custom home this past summer. When we were building it my husband had the great idea to use some of the otherwise wasted attic space and include a loft in the 5th bedroom/ office. Originally we were going to have my office on the main floor and the guest room in the loft, but decided to switch that up. Now we just need to buy the bed! We have been using an air mattress so far. This is definitely a useful thing to have especially if we tend to have unexpected guest.